Serve as MCs (Masters of Ceremonies) in other Cathedral liturgies. 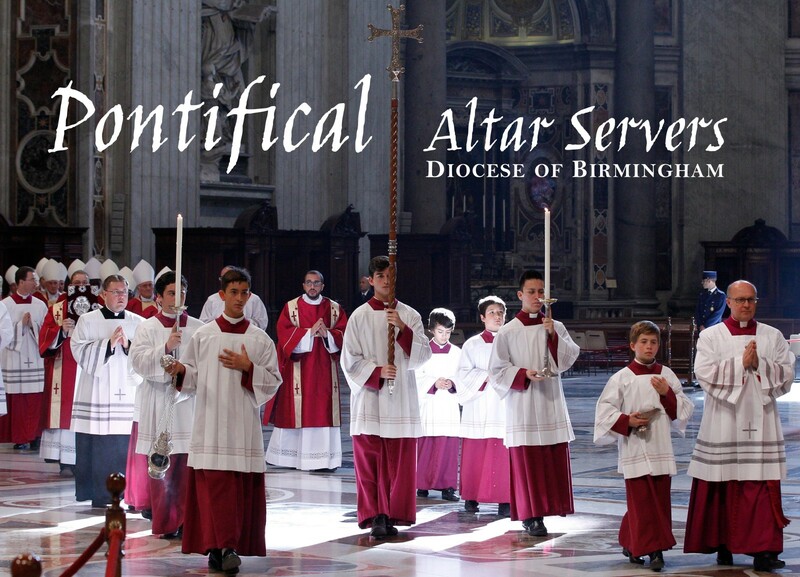 To that end, and with Bishop Baker’s blessing and encouragement, we are pleased to invite young men in grade 8 and above to join the newly-established ranks of Pontifical Servers in the Diocese of Birmingham in Alabama. The Pontifical Servers will consist of a group of well-trained young men who serve at those sacred liturgies and other ceremonies at which the Bishop presides. The Bishop and the Cathedral are important because they signify Christ and the Mother Church, the center and model of liturgical life of the Diocese. Those who serve as Pontifical Servers will participate in this life of the Diocese in a major role. We pray that this association will provide a means for young men to grow in their faith and love of both the Church and her Sacred Liturgy. The Pontifical Servers will take up the custom of wearing the color traditionally called after its Italian name, ‘paonazza‘ – the same violet color that monsignors, canons, and bishops use. It is a long-established privilege for those who have the particular task of serving the Bishop to make use of this color of cassock, especially in the Cathedral Church. Using this special and traditional cassock for their service will undergird its important connection with the Bishop and help establish a strong esprit de corps for the young men. The cassock is a traditional indication that the young man is “standing in” for a cleric, and has long been associated, in conjunction with altar serving, with the goal of inspiring young men to think about priesthood. Under the guidance of St. John Vianney, patron saint of parish priests and co-patron of the Diocese, and St. John Berchmans, patron saint of altar boys, the Pontifical Servers association is structured in such a way as to facilitate vocational discernment through closeness to the sacred mysteries of the altar. It is our prayer that God will use this initiative as an avenue for bringing forth an abundance of good priestly vocations in the Diocese of Birmingham. In addition to the age requirement, Pontifical Servers will have received the sacrament of Confirmation, regularly receive the sacraments including Confession, have the permission of his parents/guardians (if he is below 18 years of age), and have the recommendation of his pastor. Membership is open to any young man in the Diocese of Birmingham. For inquiries, please contact Deacon Justin Ward, Master of Ceremonies, at jward@pcj.edu.